Copy of Trusted Identities Solutions — Axiad IDS, Inc. Organizations need the highest levels of protection against unauthorized access or IT breaches, and quick compliance with multiple mandates. 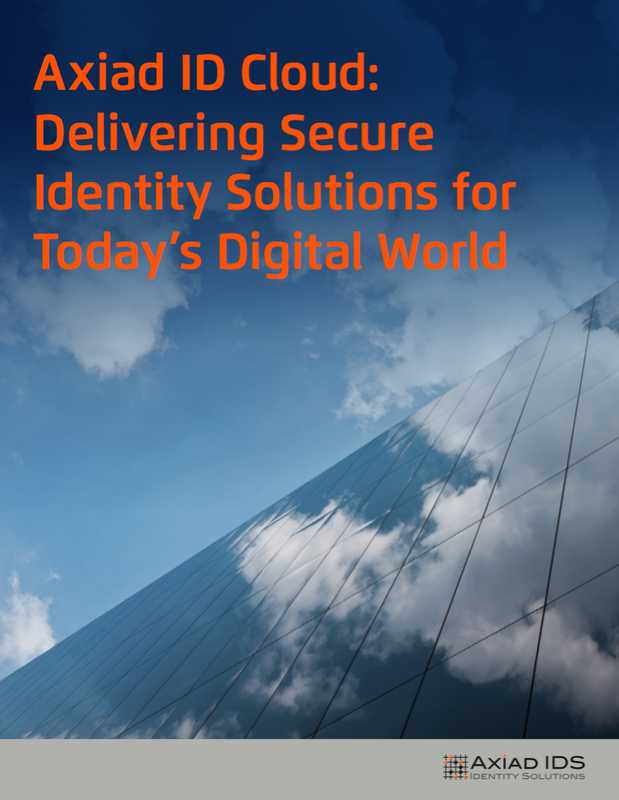 However, deploying and operating a secure integrated identities solution is complex. Even with the most advanced technologies, a piecemeal approach may leave an organization vulnerable. As the risks grow and compliance requirements get more rigorous, rolling out a seamless and secure solution becomes increasingly costly, while user experience often suffers. In addition, IT teams are overburdened, facing a shortage of resources and security experts. Axiad ID Cloud is a fully hosted and comprehensive platform that addresses these challenges. Not only is the Axiad ID Cloud highly secure, it is easy to deploy, reduces risk, lowers upfront investment, and can be operational in just a few days. We work with you to design, implement, and manage the solution with the assistance of a consolidated dashboard and analytics for all devices, identities, and credentials. The platform also takes trusted identity beyond physical smart cards to phones, laptops and other mobile devices by allowing virtual smart cards and derived credentials to authenticate users and establish and perform secure digital transactions. The Axiad ID Cloud delivers FIPS 140-2 level 2 Smart Cards and EPCS certificates. The modular platform allows you to cost-effectively implement and manage a mix of user credentials across a range of assurance and authentication levels to meet an organization’s unique needs. All of this provides the confidence and trust to thrive and conduct business in today’s digital world. Implementing and managing mission-critical identity systems is complex. Advanced technologies are available, but too often solutions involve multiple suppliers, leaving the management and cost of integration to fall on already-stretched IT departments. Axiad IDS manages this complexity for you. As a fully hosted-service, Axiad ID Cloud is easy to deploy, reduces risk, lowers upfront investment, can be operational in a few days, and is highly secure. By removing the need to be IT security experts, organizations are freed to focus on their core business and quickly and easily comply with even the most rigorous mandates. The Axiad ID Cloud platform enables a portfolio of products that help organizations quickly and cost- effectively implement and manage a mix of user and device credentials covering a range of assurance and authentication levels to meet their unique needs and budgetary requirements. With products ranging from Trusted User Certificate-Based Identity, Trusted User Flexible Authentication and Trusted Infrastructure, Axiad ID Cloud offers a truly secure, integrated and simplified solution to leverage your digital assets and protect your entire ecosystem - from employees and contractors to data, devices and infrastructure. The result is better protection, simpler deployment, less complexity and lower upfront investment. Founded by a team of experts with extensive experience and strong industry knowledge, Axiad IDS has garnered recognition as an important player in the Identity assurance domain by leveraging its experience to enable organizations to implement security mandates and meet compliance requirements . In this article, learn how Axiad is helping organizations across industries quickly, simply and affordably address potential breaches head-on before they happen. Axiad IDS, a leading provider of trusted identities for enterprise, healthcare, government, and financial organizations, announced the general availability of Axiad ID Cloud, a modular enterprise identity cloud service. Axiad ID Cloud enables organization to issue, manage, and use identities they can trust. It helps organizations protect against costly data breaches and comply with rigorous new mandates. Organizations require strong identities they can trust to conduct business, while customers, employees, and citizens need a less frustrating method to authenticate their identity. Our mission is to enable our customers to issue, manage, and use Trusted Identities for people, systems, and devices to prevent unauthorized access and IT breaches, enabling trust for today’s digital world. Trusted identities require a holistic approach; from initial issuance of the credential to securely managing that credential over time. Trusted user PKI Identity service, providing PKI/smart card and mobile device based on high assurance digital identities. Trusted Infrastructure: Identity for IT Systems.